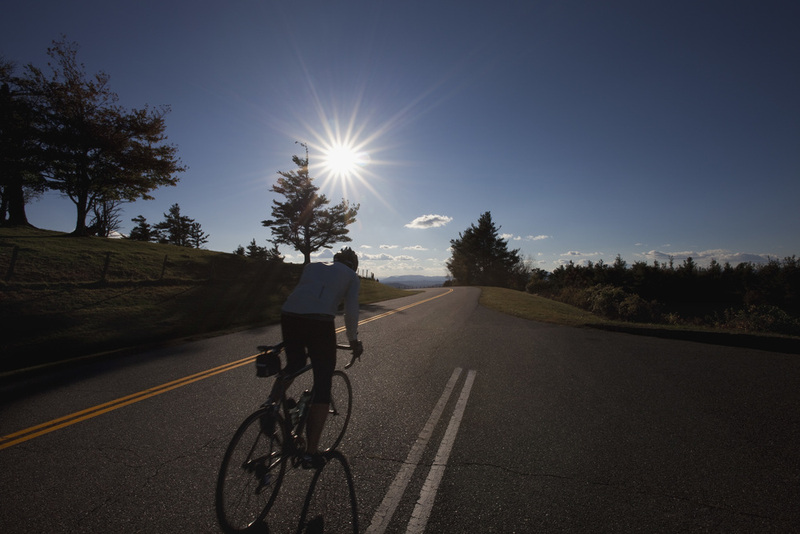 The Bitter Southerner Looks at the Blue Ridge Parkway From the Ground Up With Through-Cyclist Dave Whitling. Road cycling North Carolina and Virginia. Would such a proposal gain the support of a U.S. senator and eventually the endorsement of the president? Calculating the odds of such a scenario in today’s world would challenge the mathematical skills of Las Vegas’ best bookmakers. But 80 years ago, it happened. The U.S. Government put $16 million (the aforementioned $288 million in today’s dollars) into just such a project. And thus we have the 469-mile Blue Ridge Parkway. Today, the debate over whether to undertake such a venture would probably focus on economics or eminent domain. But we’d probably talk very little about the value of beauty and interest — or about the cultural and spiritual impact the venture might have in the decades to come. 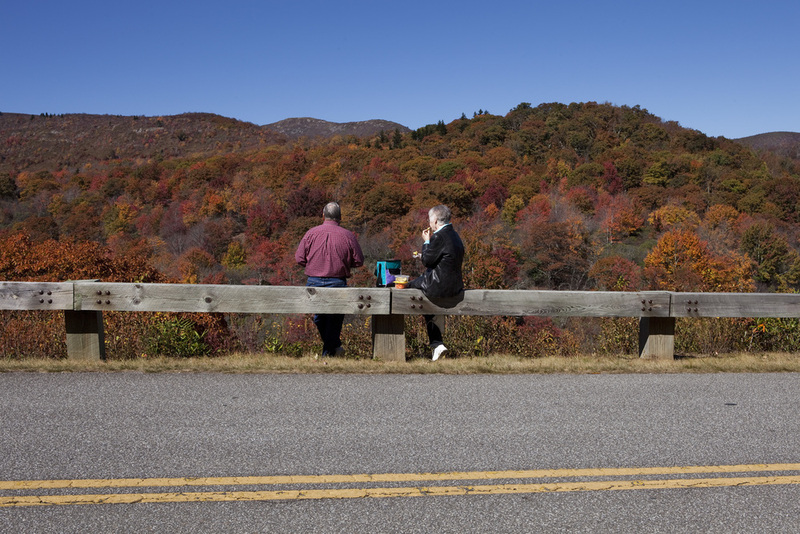 The Blue Ridge Parkway still draws tourists from all over the world, but back when it opened, it did something else. It allowed the mountain people of the South to get out of and above their own hollows and valleys, to see the beauty and interest of their homeland through a brand-new set of eyes. I was a Southern Appalachian mountain kid in the 1960s, when the final sections of the Parkway opened. My parents insisted on an annual week of vacation, and the Parkway drew them like magnets every summer. We’d load up the car, drive 100 miles from North Georgia up to Maggie Valley, N.C., and find a little motel. They’d take me to tourist attractions, like the fake gunfights at Ghost Town in the Sky. But we spent most of the time in a 1963 Chrysler 300, just meandering on the Blue Ridge Parkway. Mama and Daddy would look out the windows, marveling, and talk about the beauty of the mountains that were already their home. For them, that was good life aplenty. Arguably the first person who truly understood the Parkway’s nature was R. Getty Browning, the state of North Carolina highway engineer who laid out the route by walking its entire length, all 469 miles. He said one had to see the situation on the ground. Unless you are a hardy hiker with a month or more of free time, the Browning method is not much of an option these days. To see the Parkway from the ground, unenveloped by the cocoon of the automobile, the only other option may be the toughest: to do it on a bicycle. That’s exactly what The Bitter Southerner’s own creative director, Dave Whitling, did. In five days, he pedaled all 469 miles. “I’ve loved riding bikes for as long as I can remember,” Dave says. Be Dave’s friend for a few years, and you learn how utterly true that statement is. To see Dave arrive somewhere in a car is surprising. He’d rather pedal. “I love the pace at which a bike covers ground and how it allows you to experience the passing environment on both a micro and a macro level,” he wrote after he finished the ride. “Cycling has always been a very personal endeavor for me. I’ve never really been interested in racing or in competing with others. In all my many years of riding, I had never attempted a multi-day cycling tour of any kind. Sure, I’d done plenty of weekend century (100-mile) rides, but nothing on a scale like this. Even my experience cycling in the mountains was fairly limited. But Dave did it anyway. He rounded up his friends Jim Baker and John-Robert Ward to drive the SAG wagon (Support And Gear) and to take photographs. They headed to Rockfish Gap, Va., the northernmost entrance to the Parkway. Dave would, of course, pedal south. Beauty and interest, just like they said all those years ago. This week, The Bitter Southerner is proud to bring you Dave’s day-by-day account of his 469 miles on the Blue Ridge Parkway. Sunny skies, lush rolling farmland and a 13-mile leg-burner to kick things off. Jim, J.R. and I rolled into Waynesboro, Va., at around 6 on Monday evening. We checked into the Best Western (only four and a half miles from the start of the Parkway), got our bearings and grabbed dinner at the Cracker Barrel next to the motel. Just as we were settling into town, we happened to catch an amazing sunset. We agreed that it was a good omen for the trip ahead — doubly so after the rainbow we had seen earlier in the afternoon. A laid-back night at the hotel gave us one last chance to sort through gear, charge our batteries and get everything in order. A little nip in the air, but otherwise stellar weather. With the sun climbing up over the horizon, we packed out of the motel and made the short drive east down I-64 to the point where Skyline Drive and the Blue Ridge Parkway meet. There was a nice turnout off the side of the road (as there always seems to be on the Parkway). We pulled off, geared up and I got ready to pedal. The landscape on the northernmost end ultimately proved to have some of my favorite scenery. Lush, mountainous farmland lined the Parkway on both sides for much of the day. 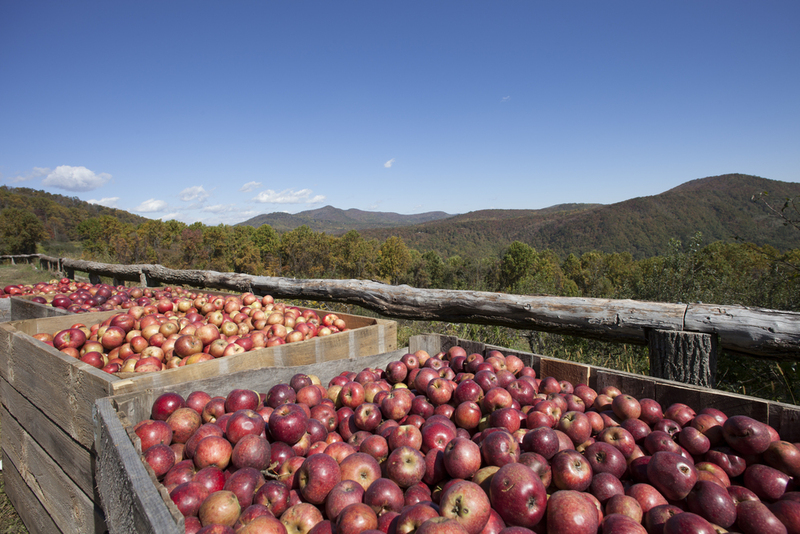 It’s a lucky thing that the scenery was so hypnotizing, because a little more than midway through the day, I encountered Apple Orchard Mountain. For a mountain with such a benign name, this climb was especially brutal. I spent a little over an hour pedaling up the 13 miles, ascending more than 3,300 feet. This was the biggest climb I had ever done — and on the first day of the toughest ride I had ever undertaken. After suffering up Apple Orchard Mountain and on a few miles further, I arrived at the Peaks of Otter and the Peaks of Otter Lodge. The lodge is one of only a handful sitting right on the Parkway. The views there are beautiful. Sadly, there were no rooms available — I had arrived during peak leaf-gazing season. I took in the views just before sunset, then managed to push on a few miles more. Overall I put in 97 for the day, staying just above the necessary average to meet my five-day goal. Morning rain drizzling through the Smoky Mountain haze, a beautiful start to the ride. Temperatures climbed into the low 60s, so the rain made for fairly pleasant riding conditions. The scenery through the Roanoke Valley was absolutely beautiful. Rolling pastures, grazing cattle and aging barns dominated the landscape. Having grown up in a rural area of Georgia, there was something nostalgic and comforting about this section of road. Starting in the base of the valley meant a slow climb to start out the day. While the elevation charts seemed to promise a rolling-hills kind of day, I soon discovered that today’s 100 would still manage to pack in more than 9,000 feet of climbing. I ran into a gentleman out for a day ride from Roanoke — only the second cyclist I had seen so far. I had expected more. Apparently I was riding later in the season than most people who through-cycle the Parkway. When I had come up for training rides, the Parkway employees warned of the “leafer” traffic that would saturate the Parkway during peak season. Up to this point, however, I’d felt as though I had the Parkway to myself. The courteous nature of the little automobile traffic there was also deserves mention. It was a far cry from the aggressive gauntlet of urban traffic I’m used to riding through. 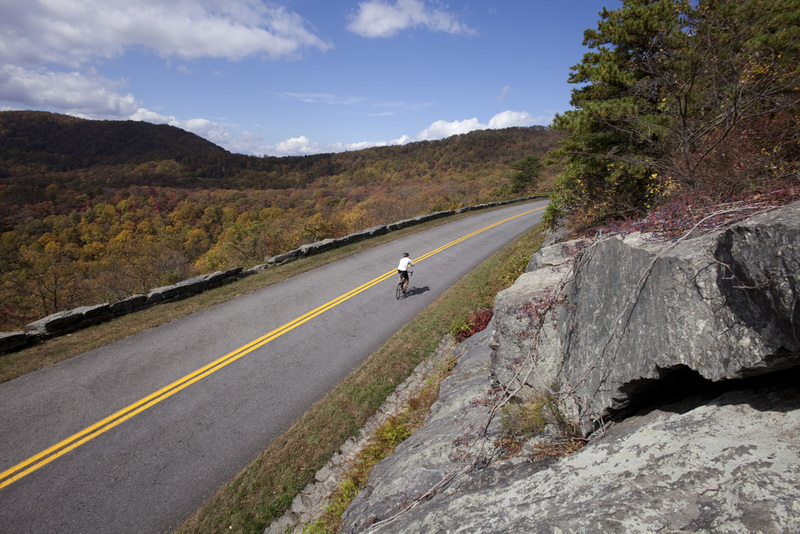 The design of the Blue Ridge Parkway really does a great job of encouraging a laid-back flow and a pleasant coexistence between motorists and cyclists. Temperatures continued to hover in the high 50s, and late morning brought an end to the rain. As the day stretched on, I passed Parkway highlights like Tuggle Gap, Mabry Mill and the Roanoke River crossing. I could have easily spent hours lying around in any one of the sunny meadows lining the road in this section. But those miles weren’t going to pedal themselves. Given that I had just finished the most attainable section of the Parkway in terms of elevation, today’s effort left no room for doubt there would be no easy part of this ride. Still, I had two days down and another 100 miles in the bag. Drink lots of water. Eat constantly. Pedal. Wednesday morning, we woke up to the kind of weather that makes you want to hit the snooze button, roll over and stay in bed. I have to be honest; when I saw how hard the winds were whipping, the last thing I wanted to do was get up and pedal another 90+ miles. The gusting winds (up to 37 mph) had also brought with them much cooler temperatures and heavy rains. We had to backtrack a bit to reach the previous day’s stopping point. The half-hour drive was enough time to let it get light outside, and for me to get a solid cup of coffee down. I can’t say that I was exactly eager to get going. Nevertheless, once I began pedaling, all was well with the world. Rain is a fairly manageable element on the bike — high winds, on the other hand, can become quite a challenge. The winds and rain did, however, create a beautiful scene, spreading a deluge of multi-hued leaves onto and around the Parkway. I found myself marvelling at how the Parkway manages to get more beautiful as the weather worsens. Soon the rain cleared, though the temperature continued to drop. It settled into the low 30s by day’s end. Although the winds failed to let up even for a moment, the scenery continued to captivate. About 23 miles into the day I crossed from Virginia into North Carolina. 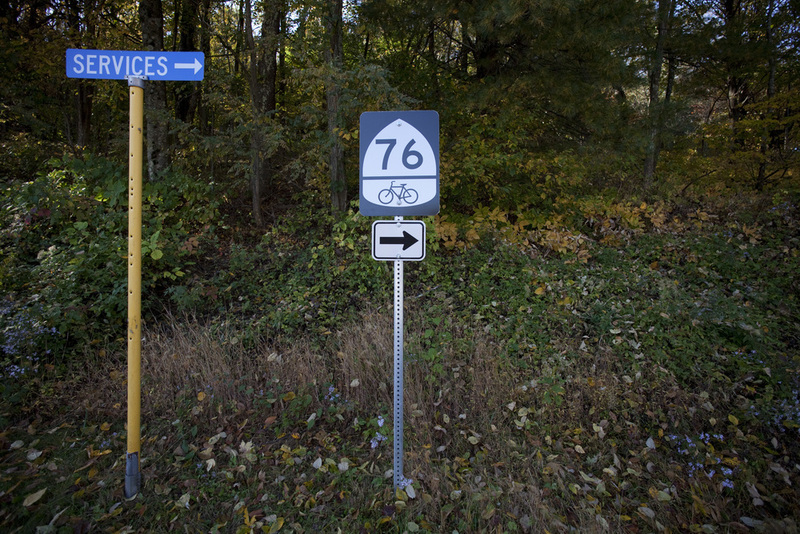 The state line marker lies on a shady and fairly unassuming stretch of land — rare for the Parkway. Two-and-a-half days into the ride, I found myself at the halfway point. My legs felt great and the bike was riding and shifting smooth. All was well, except for the damned winds that just kept on blowing. For the most part, my eating pattern was to graze constantly, both on and off the bike. I ate Clif Bars until I couldn’t, but I believe the key to my success was the abundant supply of mini-muffins I had with me. Homemade, packed with carbs and easy to store in a jersey pocket, these little muffins were without a doubt my favorite. They were great first thing in the morning, and the variety of flavors I had on board kept them appealing through the entire day. Finally, I celebrated the completion of each day’s effort with organic low-fat chocolate milk — commonly thought to be the ultimate recovery drink. Tunnels, wind, feats of civil engineering, wind, traffic … and did I mention the wind? The wind was ripping through us at the staging spot this morning. Combined with the already cooler temperatures, it had us bundled up pretty tight. I was eager to get rolling, if only to begin generating some body heat. While the previous day’s ride consisted of a constant westerly wind, today the gusts came from all over the place. I knew it was bad when I found myself down-shifting gears while riding downhill into a headwind. The challenge of day four’s weather, however, was validated by a stream of great vistas and Parkway landmarks. One of the defining architectural qualities of the Parkway is its 27 tunnels. To a cyclist, their pitch-black interiors can cause disorientation, even if you have a proper headlight. I even experienced a brief vertigo-like sensation in some of the longer ones. Of the 27 tunnels, only one is in Virginia. The southernmost end of the Parkway, around Asheville in particular, is tunnel territory. I had been looking forward to hitting today’s section for several reasons, but the top draw by far was crossing the Lin Cove Viaduct. The stretch leading up to the viaduct is a steady five-mile climb with majestic Grandfather Mountain looming above you in the distance. The last section of the Parkway to be completed, the viaduct is an amazing feat of engineering. 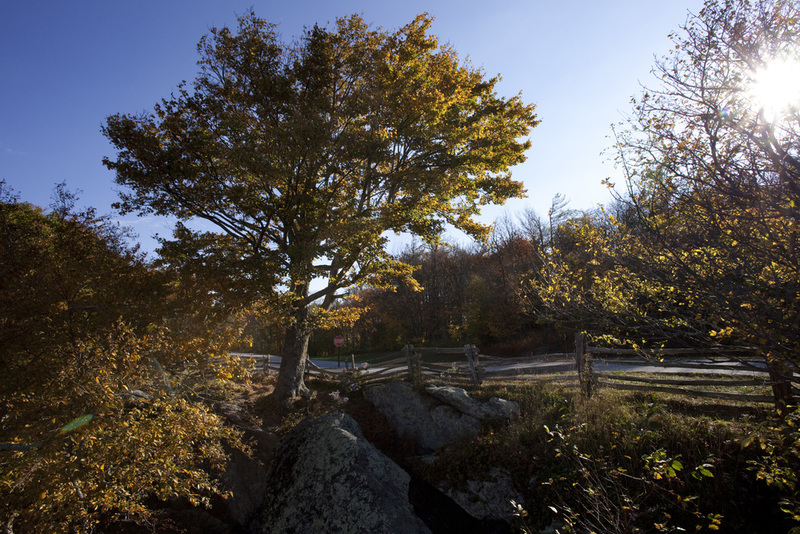 Built in partial suspension, the core principle of its design was to make it as unobtrusive as possible to the topography of Grandfather Mountain ­­— or as unobtrusive as a modern road can be. Often captured in iconic photos, the viaduct is a curvy overhanging section of road that wraps around the side of the mountain so intimately that you can nearly touch the rhododendrons. On a bike, you are also close and quiet enough to see and hear the streams underneath as they run down the mountainside. It was an amazing stretch of road. As the day progressed into late afternoon, I passed Mount Mitchell. 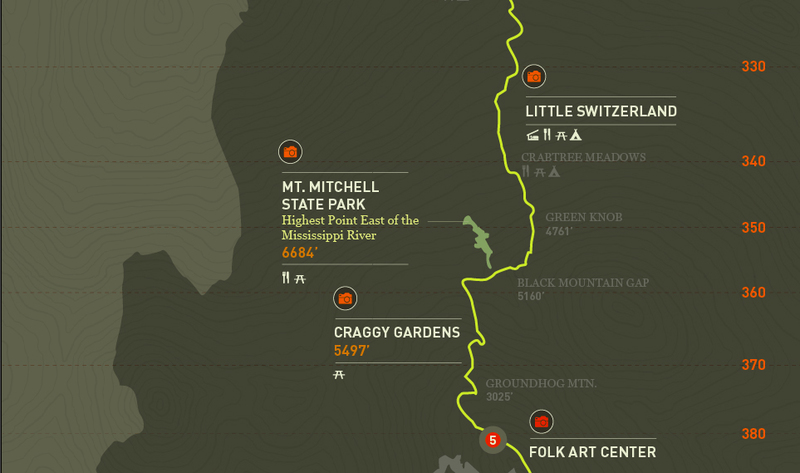 At 6,684 feet, it is the highest point east of the Mississippi River. The mountain called to the explorer in me, but I was already facing an after-dusk finish and didn’t have the time to detour off the Parkway. Rest assured, Mount Mitchell: I will return. Arriving in the Asheville area felt good. Not only was it familiar territory, but it also meant the final stretch was just ahead. It was an amazing 10-mile descent down to the French Broad River. Traffic thinned out pretty quickly as the sun began to set. With the road to myself, I raced the sunset down the mountain. The gift of the final descent. It felt pretty damned good to know that I was on the home stretch of the ride. The winds finally settled down after two days of constant gusts, and a crisp, cool, sunny morning greeted me for the final stage. The morning began with a descent of several miles, bottoming out at the French Broad (2000 feet). From there it was up, up, and up. 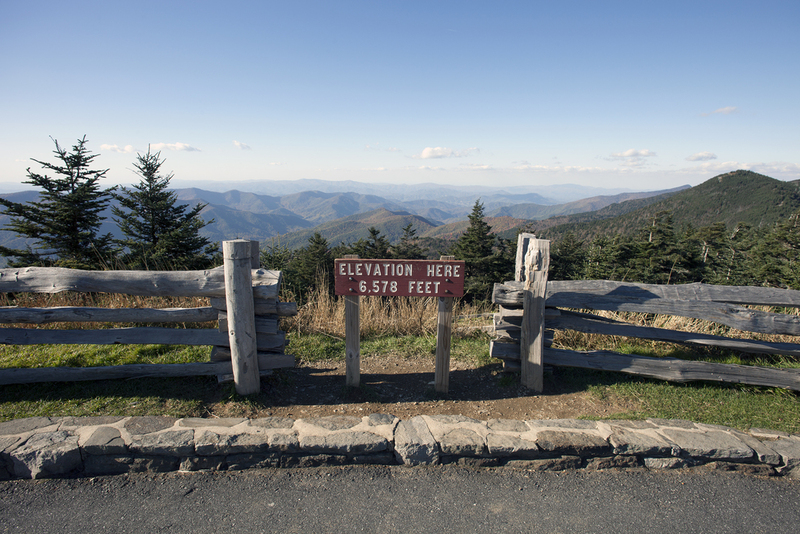 From its lowest point, the Parkway promptly begins a 15-mile climb up Mount Pisgah and then on to the highest point on both the Blue Ridge Parkway and Skyline Drive — the Richland Balsam Overlook. 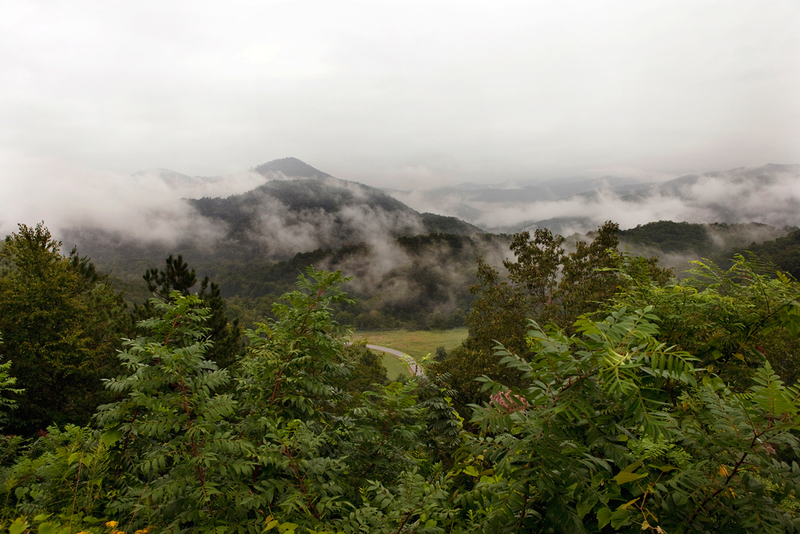 The Richland Balsam Overlook sits at mile 431 and stands proudly at 6,053 feet. From there comes a quick descent, then one more 3,000-foot climb and the home stretch ahead. As a cyclist who had just ridden what felt like uphill both ways for five days, I couldn’t have asked for a better gift than the final 10-mile descent into Cherokee. As I raced downhill pushing 40+ mph for what felt like an eternity, I couldn’t help but revel in the accomplishment. With little more than an hour of daylight left, I rolled up to a welcome sight — the 469-mile marker. Four-hundred-sixty-nine miles in five days. Done. I had spent 38 hours in the saddle, climbed 48,601 feet and seen too many breathtaking vistas to count — all without so much as a flat tire. Still standing and still smiling, the ride had gone amazingly well. I had done it. This was by far the most demanding ride I’ve ever undertaken, but the rewards it returned far outweighed what it required. 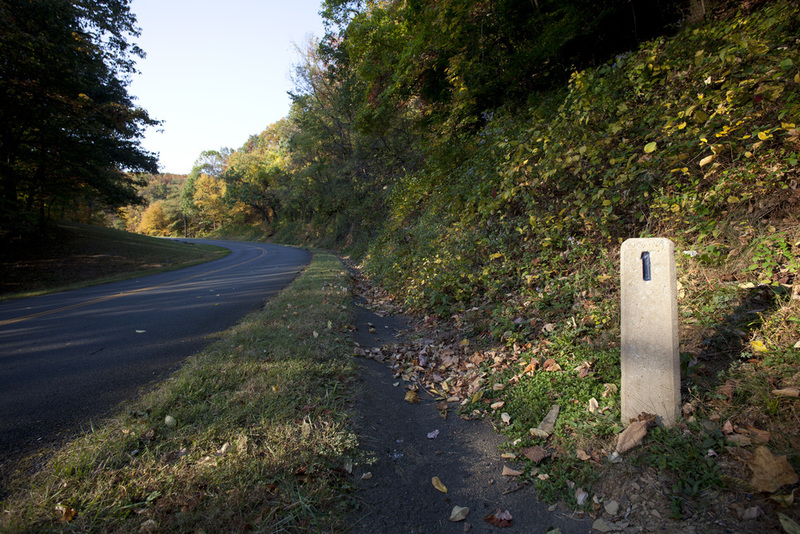 Scroll your way through the complete route Dave traveled — from Blue Ridge Parkway Mile Marker 1 to Mile Marker 469. There were simply too many great photographs to fit in a single page. 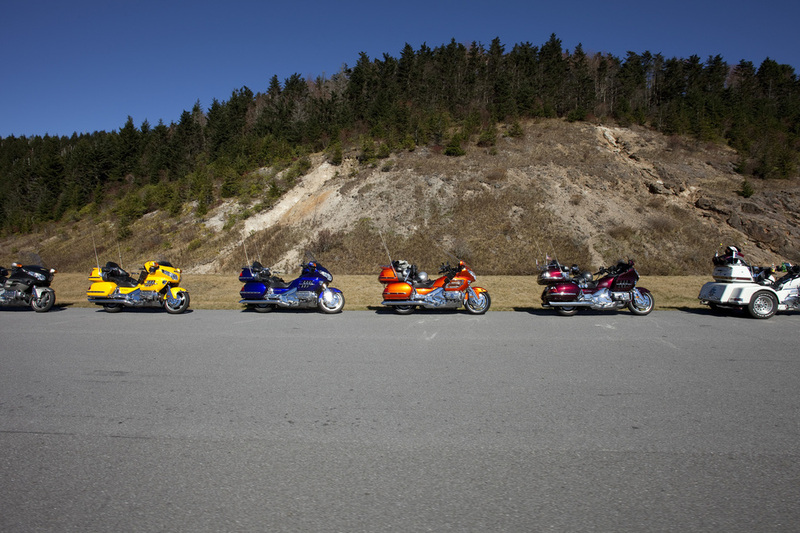 Here are a few more choice images from the 469 ride. For Thanksgiving week, The Bitter Southerner’s editor-in-chief, Chuck Reece, brings us some memories of his gospel singer parents, Clarence and Flora Reece — and a story about how a single item, forgotten in a closet for more than 40 years, can restore blessings you thought were gone forever. To contact The Bitter Southerner for any reason at all, you can connect with us through Facebook.